[84 Pages Report] Automatic tube cleaning systems (ATCS) work round the clock to avoid the formation of deposits in heat exchangers and condenser tubes that are installed in industries such as power plants, refinery, hospitality, and commercial space. The periodic cleaning of condenser tube can be done with the help of ball-type automatic tube cleaning systems or brush-type automatic tube cleaning systems. ATCS are, therefore, used for reducing the frequency of costly maintenance shutdowns while optimizing equipment function and increasing energy savings. Improvement in operational efficiency of HVAC systems due to automatic tube cleaning system installation is one of the key factors driving the market growth. The automatic tube cleaning system market was valued at USD 100.4 million in 2017 and is expected to reach USD 130.5 million by 2023, at a CAGR of 4.53% during the forecast period. The base year considered for the study is 2017, and the forecast period is between 2018 and 2023. The objective of the report is to provide a detailed analysis of the automatic tube cleaning system market on the basis of type, industry, and geography. The report provides detailed information regarding the major factors influencing the growth of the automatic tube cleaning system market. The report also provides a detailed overview of the automatic tube cleaning system market positioning of key players. 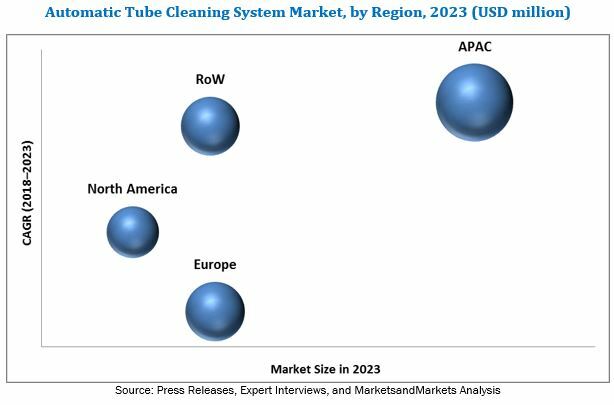 Major players involved in the automatic tube cleaning system market are TAPROGGE (Germany), Hydroball (Singapore), Ovivo (US), WesTech (US), BEAUDREY (France), Ball Tech (Israel), Nijhuis (Netherlands), WSA Engineered Systems (US), and Watco (Singapore). This research report categorizes the automatic tube cleaning system market on the basis of type, industry, and geography. The automatic tube cleaning system (ATCS) market is estimated to grow from USD 104.6 million in 2018 to USD 130.5 million by 2023, at a CAGR of 4.53% between 2018 and 2023. The problem of fouling and scaling in the tubes of heat exchangers reduces efficiency and causes energy loss, which is resolved by the installation of ATCS. ATCS are, therefore, used for reducing the frequency of costly maintenance shutdowns while optimizing equipment function and increasing energy savings. The growth of this market is propelled by the significance of improvement in operational efficiency of HVAC systems due to automatic tube cleaning system installation. Ball type tube cleaning system is expected to dominate the market in the near future as the balls are inexpensive and can be easily changed and ball type tube cleaning system is inline cleaning system hence the cleaning can be done without interrupting the operation. The market for the power generation industry is expected to grow at the highest CAGR during the forecast period. Power plants have to deal with an increasingly harsh environment; hence, maintaining the performance of condenser tubes that have an enormous impact on the efficiency of power generation plant is the major issue, which is resolved by the installation of ATCS as the power is generated at maximum efficiency at all times. The market in APAC is expected to hold the largest share by 2023. The region has a high potential for automatic tube cleaning systems. The growing need for energy saving and improving operational efficiency in refineries and commercial spaces drives the market for automatic tube cleaning systems in APAC. The growing electricity demand backed by rebounded growth in the economy is expected to establish more power plants, which, in turn, is expected to propel the demand for automatic tube cleaning systems in the power generation industry in the next few years. One of the key factors restraining the growth of the automatic tube cleaning system market is the design-related faults/limitation in some automatic tube cleaning systems . A few automatic tube cleaning systems have design faults/limitations. Sometimes, the heated water leaving the condenser mixes with water re-entering the cold water system, thereby reducing the efficiency of the chiller. Also, the additional energy is needed for heat transfer. Further, after the cleaning process, balls are collected in a ball trap, which includes a strainer or screen, allowing water to flow continuously but preventing balls from escaping downstream. Mechanically actuated clamshell-like screens were used in early designs of ball traps, which are used today as well. However, these designs are sometimes prone to mechanical failure leading to ball loss and decreased condenser efficiency. TAPROGGE held the leading position in the global automatic tube cleaning system market in 2017. The company operates in the optimization of water circuits. Solutions offered by the company are for power stations, seawater desalination plants, refrigeration plants, and industrial plants. The company’s IN-TA-CT (Integrated TAPROGGE Concept) provides assistance to its customers in planning and purchasing products, and IN-TA-S (Integrated TAPROGGE Services) addresses the needs of its customers or operators. TAPROGGE has been in the optimization of water circuits business for more than 50 years and offers solutions for power plants, seawater desalination, and refrigeration and industrial plants. The company’s products are tested for safety at their own technological centers. The company is present in the US, China, Germany, South Korea, Japan, Russia, Spain, France, and the UK. The company has a strong product in the automatic tube cleaning system market. Other significant players in the market include Hydroball (Singapore), Ovivo (US), WesTech (US), BEAUDREY (France), Ball Tech (Israel), Nijhuis (Netherlands), WSA (US), and Watco (Singapore). *Details on Business Overview, Products/Services Offered, and MnM View Might Not Be Captured in Case of Unlisted Companies.